Carrying on with the dessert theme, since 4 more days til Christmas! Here is the recipe we have always used for fudge! There are a million ways you can change up the chocolate chips and make different flavours, colours, really whatever you want! Before starting line an 8×8 pan with tinfoil so the fudge can be easily removed, you’ll be stirring constantly, so lining it later isn’t really feasible. Dump all the ingredients into a pot, and stir constantly over low heat. 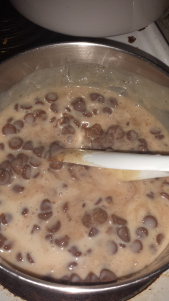 Keep going until all the chocolate chips are melted and it’s nice and smooth. Pour the stuff in the pot into your lined pan. Smooth the top if necessary, I don’t usually find it necessary. Take your pan and place it flat in the freezer until it’s set, if you don’t have freezer space, flat in the fridge will do as well, it just takes a tad longer to set. That’s it! So super easy, and fast, great to make up quick before a potluck!